If you don't find what you're looking for, let us know and we'll keep it in stock for you. Outstanding customer service and quality control. Zarifa personally inspects each and every item prior to shipping and is always available via email or phone to answer questions about items on this web site. Some of this year's hot items include regular and Turkish style belly dance swords, coin bras and tops, belly dance head ornaments, zills, and arm bracelets. Zarifa's continues to include a FREE gift with every order of $100 or more. It we say it's in stock, it's in stock. The inventory for all of Zarifa's product pages are updated automatically. 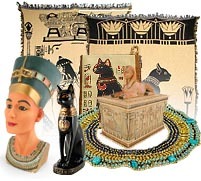 If the page says it's in stock, we have it, including many hard to find or discontinued Egyptian Decor items. Zarifa also carries many hard to find hand made Egyptian items, such as these beautiful hand made beaded collars, hand made Bastet and Isis coin purses, this elegant Egyptian collar and belt, and signature Maat, Bastet, and Egyptian Girls throw blankets. As always, Zarifas continues to offer the best prices and shipping of her favorite Egyptian statues. NEW! In addition to Zarifa's belly dance classes that have been an outstanding hit, Zarifa now offers workshops in the San Diego area: healing stone and crystal healing, healing oils and candle therapy, moon cycles, Egyptian gods and godesses, Feng Shui, and learning the tarot. Learn how you can get a workshop free, in the privacy of your own home. Get started today! Last December Zarifa began offering gift packages, collections of several items throughout her store at an economy price, and customers loved them so much she has decided to offer them on a regular basis. Choose from Astrology packages, Egyptian, Tarot, and other gift packages, most under $20! 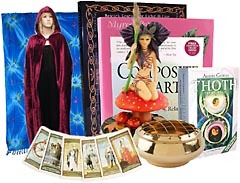 Many of these packages include a selection of books, candles, and other spiritual items with a value of up to $60 - there's some for the belly dancer in your life too! She will also have packages tailored to her upcoming workshops and classes, to be announced soon in this web site. Save now while these limited collections last. Clearance items: Zarifas.com will soon shift it's focus to the items that are closest to Zarifa's heart, hand-picked and unique belly dance costume and accessories and Egyptian decor. We'e clearing out a lot of metaphysical and spiritual items to make room for new inventory, so save now on these marked down tapestries, books, candles, incense burners, home and garden decor, and spiritual items while supplies last. When they're gone, they're gone! Over 170 unique belly dance items in stock and growing daily. 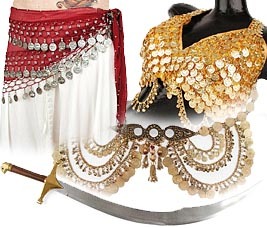 Buy quality belly dance costume, belly dance swords in many styles, belly dance hip scarves, belly dance jewelry, bellydance choli tops, coin bras, harem pants, chiffon veils, zills, belly dance necklaces, bracelets, and anklets in a variety of styles. Zarifa's Touch of Egypt, offering the best prices in quality bellydancing costume, Egyptian decor and Egyptian statues. Zarifa's is a short drive from anywhere in the San Diego area, including Hillcrest, Mission Hills, La Mesa, and El Cajon.